Caletas is considered one of the most beautiful places in Puerto Vallarta, a natural tropical getaway only accessible by sea surrounded by lush jungle and spectacular secluded virgin beaches, representing truly natural paradises of unique beauty. 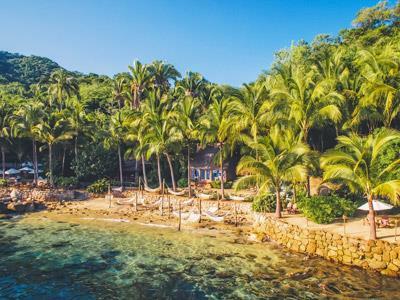 It was the famous film director John Houston who made of Caletas a popular destination in the Banderas Bay, and as the locals say he was so stunned that he built a private home where he used to live, with the additional attraction of movie stars visiting him. Your adventure starts aboard comfortable boats that will transfer you in a tranquil trip to Caletas. Once there you can choose between a relaxing time in a hammock or just enjoy the sun at gorgeous golden sand beaches. If you want to explore the bay or take part of any activity you’ll find multilingual guides offering snorkeling, scuba diving or kayaking. Moreover we’ll pamper you with an adorable therapeutic massage at the hilltop Spa. Taker a stroll around and don’t miss a free guided nature walk through the jungle, for admiring beautiful garden orchid and an interactive parrots center. Caletas offers an array of activities for spending a great day and the unique opportunity of meeting a truly Garden of Eden in Mexico.